On a whim Jun decided that we were going to visit Keyuan Garden in Dongguan. 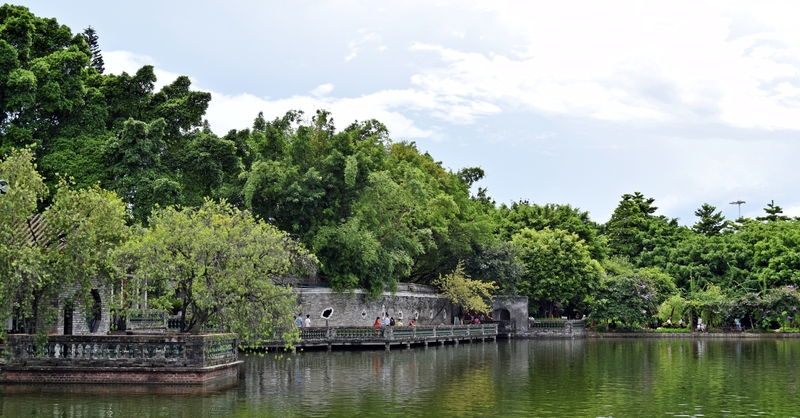 It’s one of the Four Renowned Gardens of Guangdong from the Qing dynasty. Each of the gardens represent the Lingnan garden culture that tied architecture, art, and nature together in a delicate balance. Keyuan was the last of the four gardens I had to visit. I had previously visited the other three in the last four years. It was nice to finally get to cross this off my list as I rarely have a reason to be in Dongguan. This garden has its own unique feel compared with the other gardens. Keyuan feels much more intimate than the other three with the how close the buildings are to each other. Adding to this feeling are the different corridors that meander around the structures. The buildings are tightly linked to each other; it creates that intimate feeling as you walk around the different structures. Tied with how lush the gardens are and how intermingled they are to the buildings leads to a wondrous feeling to the place. From the main structure the gardens go to a surrounding park centered with a pond. The park has a nice museum with a variety of art and examples of Lingnan architecture. In one of the courtyards there are examples of different building features to examine. The gardens are beautiful and shows another side to the Lingnan gardens other than the other three gardens in Guangdong: Yuyin in Panyu, Liangyuan in Foshan, and Qinghui in Shunde. It was definitely a nice visit.